The 1980’s began with the world in a major recession and the U.S. had massive inflation and unemployment. In addition to economic woes, Jimmy Carter was dealing with the 444 day Iranian hostage crisis which began on November 4th 1979 and culminated precisely at the conclusion of Reagan’s inaugural address on January 20, 1980. Reagan was a staunch believer in laissez faire capitalism and a follower of “Austrian economics” he emphasized reduced government intervention, lower taxes and deregulation of the stock markets which lead to an economic revival in the mid- to late 80s. 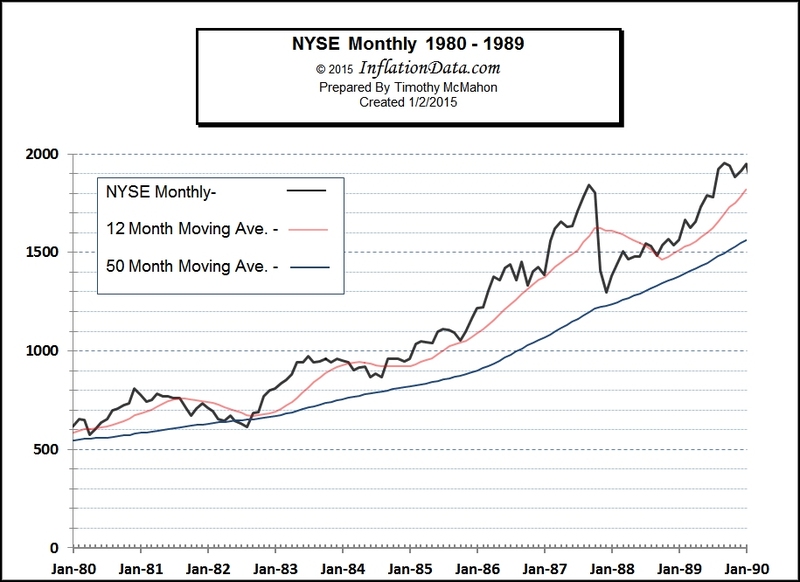 Over the decade the New York Stock Exchange nearly quadrupled as it went from just over 500 to almost 2000. At the same time the Consumer Price Index increased 62% from 77.8 to 126.1 so the stock market outpaced inflation by about three-fold. 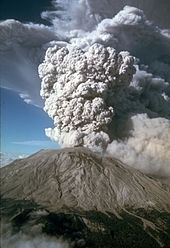 The eruption of Mount St. Helens on May 18, 1980 may have been the turning point where things started to get better. In January 1980, inflation was 13.91% and Unemployment was 6.3%. Inflation peaked in April 1980 at 14.76% and fell to “only” 6.51% the following April. By December 1989 inflation had decreased drastically to 4.65% and unemployment had declined to 5.4%. At the beginning of the decade the American auto industry was suffering partially due to the poor economy. Unions began a “Buy American” campaign which helped a little but Chrysler and American Motors were near bankruptcy. Japanese cars were produced on modern rapidly customizable assembly lines so quality defects could be rapidly corrected while American assembly lines were not so easily upgraded. This led to the popular perception that imports were of higher quality than American made vehicles. The auto makers recovered with the economy by 1983 and in 1985 auto sales in the United States actually hit a new record. But Japanese cars continued to control a significant portion of the auto market and even began manufacturing cars in the U.S. to avoid tariffs. In 1989 Canada and the United States agreed to a “Free Trade Agreement” further facilitating trade between the two North American countries by eliminating tariffs. This was superseded by NAFTA in 1994 which added Mexico to the free trade zone. In April 1981 the space shuttle Columbia was launched as the first manned American space flight since the joint Apollo-Soyuz test project ended in 1975. The shuttle program progressed smoothly from there, with three more orbiters entering service in 1983–1985. But that all came to an end with the crash of the space shuttle Challenger on January 28, 1986. Personal computers experienced explosive growth in the ’80s, ushering in the “Digital Age” and spawning a full-fledged industry. IBM launched the IBM PC, in 1981, which became the dominant computer for professional users and in 1984 Apple introduced the first commercially successful personal computer to use a graphical user interface and mouse and called it the “Macintosh”. Together they set the stage for economic growth on a massive scale. 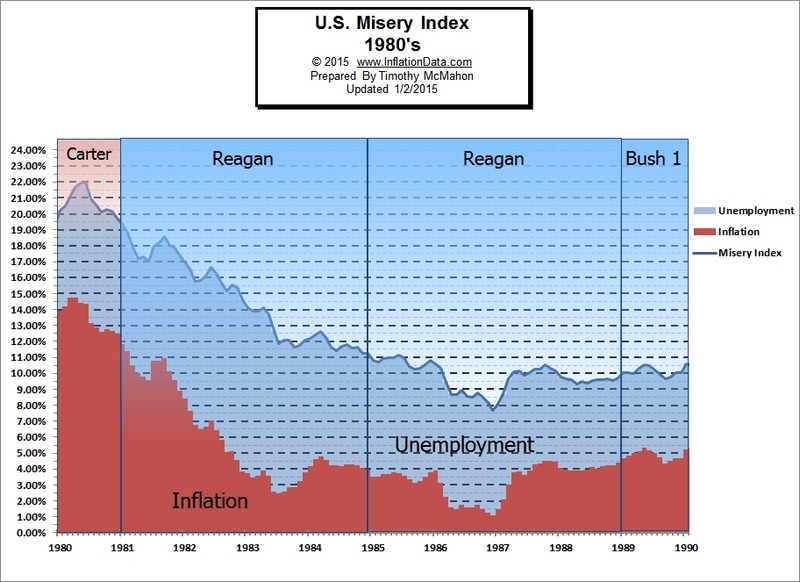 The “misery index” was created as a simple measure of the well-being of the general populous by economist Arthur Okun in the 1960’s by simply adding the unemployment rate on top of the inflation rate. The 1970’s coined the term “stagflation” which was a condition where the economy stagnates in spite of rampant inflation. Although starting badly, the 1980’s was a time of falling inflation and an improving misery index. 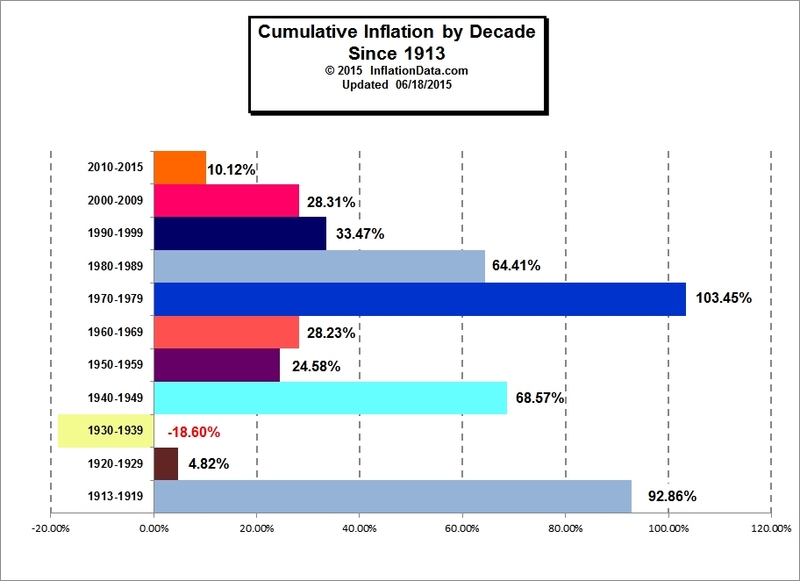 From the Average Annual Inflation by Decade chart we can see that the average inflation for the 1980′s was 5.82%, which is still considerably above the long term average of 3.18%. 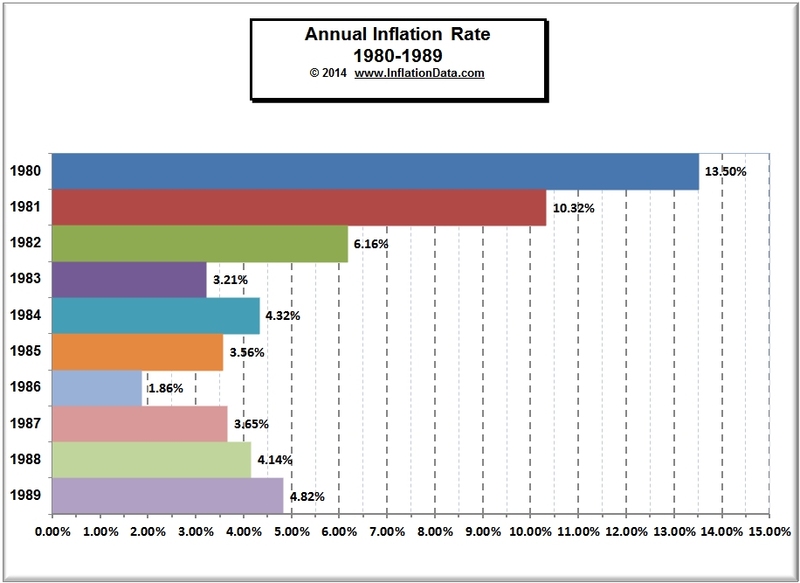 The following chart shows the inflation rates during the period from 1980-1989. 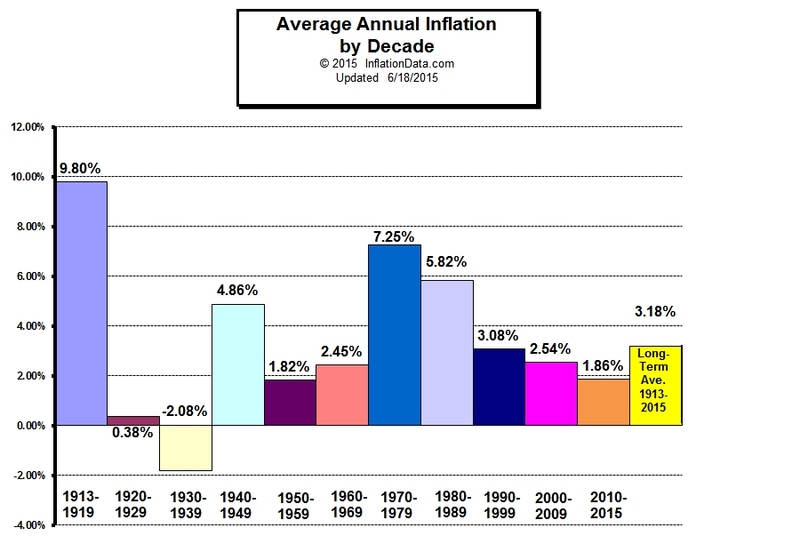 Could you provide me with a cumulative cost-of-living increase in the USA from 1949 to 2015. I plan to reimburse my alma mater for the inflation-corrected value of a $200 student loan received in 1949.